25 was a fun age to turn. Like a really fun birthday, start to finish. Friends who had recently hit the mid twenties mark had mixed reactions. Many said it felt weird. I, however, was excited. I just needed plans to celebrate that went beyond the usual. And lo and behold, a friend suggested the Charlotte Trolley Pub. You’ve seen them, you’ve heard the loud music and the laughing, you’ve witnessed the pedaling, but have you ever had the pure joy of riding one? You might think, “eh… it looks fun,” and never give it another thought. That’s how I was until earlier this month when I reserved one. The one thing I keep telling those who ask me how it was: it’s ten times more fun than it actually looks. 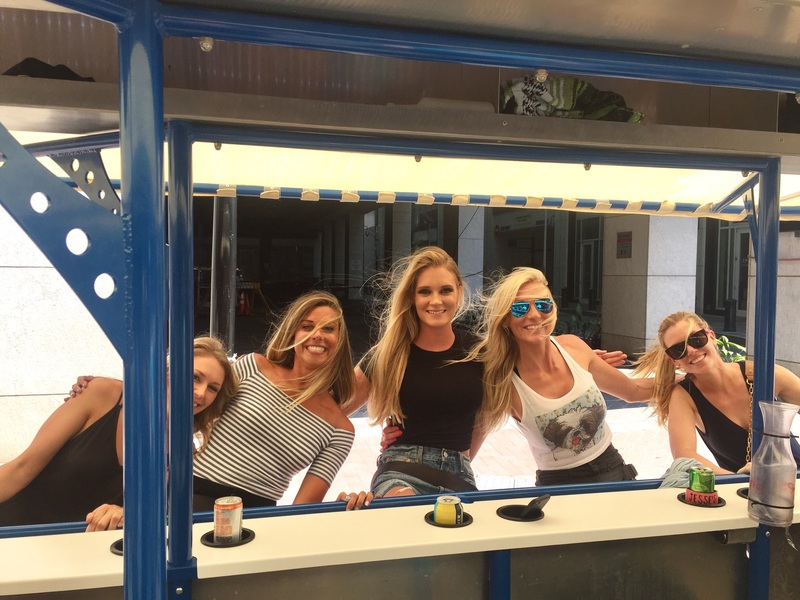 So, if you are thinking about reserving a Trolley Pub for a birthday, a bachelorette party, a work outing (or just because,) here are the 10 things you need to know. Choose a private or mixed tour. You might be with strangers on a mixed tour, and that could turn out to be an absolute blast, but with a private tour, you can hand pick 14 people you want on board. And the group you’re with is the single most important aspect to maximizing the fun on this Trolley Pub. Decide between the Uptown tour or the NoDa tour. I chose the Uptown tour on a Saturday, midday, and the vibe was perfect. Knowing both areas, determine which one would be most fun for your group. Be on time. In fact, get there 15-20 minutes early, and make sure everyone can pull up their waiver (that must be filled out online) on their phones. The Trolley Pub can’t take off until the driver sees everyone’s. BYOB! They provide a cooler, and you can even bring another one of your own if you need it. Drinking happens faster than average on the Trolley Pub, so keep that in mind when choosing your brew. Also, no liquor or glass! You really do have to pedal. There is a small engine to the vehicle, but riders really do have to pedal! It’s no excruciating cycle session, but you will work up a sweat. When the driver yells pedal, he means it. Be prepared to stop. The driver makes about three stops at bars along the route, and there are plenty to choose from on both tours. We didn’t have a preference, so our driver chose stops at the French Quarter, Connollys and Lucky’s Arcade. Be prepared to drink fast. He will give you a 20 minute window at each stop, so there will probably be lots of shots, because, efficiency. But work in a glass of water here and there, too. You’ll need it. Make a playlist. There is bluetooth audio on the Trolley pub, so go into this two hour adventure with carefully-chosen songs that will energize the group. I threw mine together at the last minute, but there was no mistaking its importance. I would rank this second most important part of the ride, next to an awesome group of people. Play along with the driver’s rules. We had a fantastic and entertaining driver, (shoutout Cam!) who had rules for when to drink. He may have been driving, but we liked to think he had just as much fun as we did. Pace yourself. It’s a quick two hours that fly by that includes lots of drinking, but don’t hit a dead end once the tour is over. Odds are, the party won’t stop there. You’ll inevitably want to hit more bars because the fun is still circulating. Tip the drivers! Our driver had Venmo and accepted tips that way, so take care of them, especially if your Trolley Pub tour ends up as great as mine. Have fun! Make your bookings online here!